Before I became a mom, I was never the type of person who said, "when I'm a mom, I'm going to do..." or "when I'm a mom, I'm never going to do..." I don't like making value judgments, especially when I have absolutely no experience. Upon becoming a mother, I created my own style of parenting. While I cannot relate my parenting style to any one style in particular, my parenting style works for me and more importantly, it works for Bella. It's pretty simple... I strive to love and to keep Bella safe and secure. Personally, I think it's very tongue and cheek, but others are deeply offended by this campaign. Having worked as a child protective investigator, I saw the worst of the worst. I worked with young mothers who lost their babies to suffocation, due largely in part to poor sleeping arrangements. Co-sleeping can be very dangerous and it's something I don't choose to do. This doesn't mean that Ian and I haven't done this with Bella, because we certainly have done. With a great deal of thought and intention during those early weeks of Bella's life, we purchased a co-sleeping travel bed for Bella. The co-sleeper assisted us in preventing us from rolling over or smothering Bella with blankets or pillows. 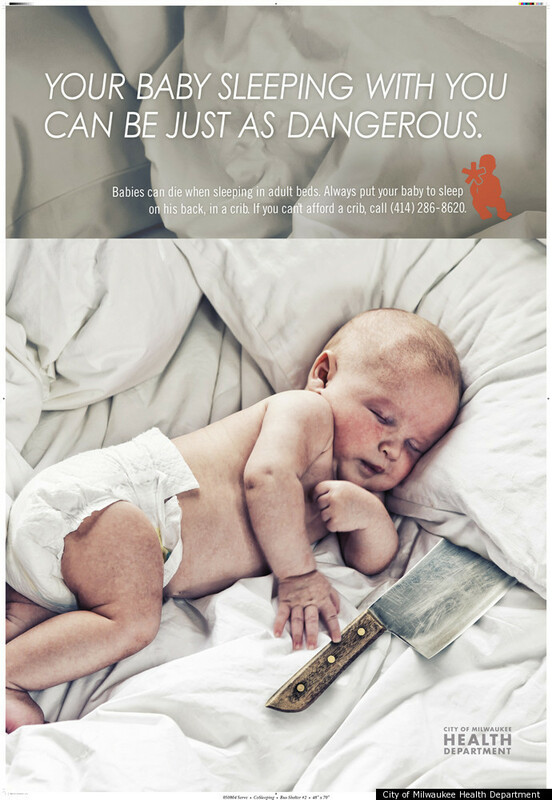 Unfortunately, most parents don't take such precautions, which places the baby in great danger. Aside from all of the obvious dangers, I think co-sleeping obtrusive. I have a hard enough time sharing a king-size bed with Ian, let alone Ian and my children! The very few times we have co-slept with Bella, I'm fairly certain Bella was the only one who actually slept. Both Ian and I were far too paranoid about smothering Bella or accidentally rolling over on her to sleep. Plus, when are you supposed to have intimate time with your significant other if there is a child sleeping in your bed? Bella has always been a great sleeper and can sleep just about anywhere. I attribute her ability to sleep to the establishment of good sleep habits. For our family, co-sleeping simply doesn't work. We all sleep better when we're in our own beds. I have many friends who believe strongly in co-sleeping. I even had a friend who posted as her status on Facebook that, "co-sleeping is so addictive." Drugs and alcohol are also addictive... need I say more? I frequently hear stories about parents having little arms and legs all over the place, which sounds really uncomfortable to me. These are the same parents whose children are nearly 2-years-old and still don't sleep through the night or take naps during the day. These parents claim that co-sleeping makes nursing easier and that they have a greater bond with their child, but I'm not buying it. It wasn't that difficult to get up and feed Bella overnight and Bella has a very strong bond with both Ian and myself. I honestly don't see any upside to co-sleeping. Perhaps more cities and states should educate parents on the dangers of co-sleeping. While working as a child protective investigator, I know I spent a significant amount of time trying to educate parents and even provided parents with pack-and-plays when they couldn't afford other sleeping arrangements. Resources are quite valuable in ensuring our child, especially our babies, are safe. Who are these people that like to snuggle their children all night? I am certainly not one of them, I look forward to bedtime because I know that a) James needs his sleep and b) I need some time to regroup and see my husband. I just don't get it, I love my baby, but I don't need to be his sleep buddy.